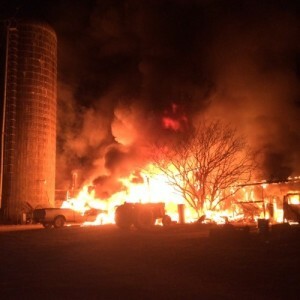 Something has gone terribly wrong on the farm or at your ag business and suddenly your social media channels are under fire. You’re flooded with questions from concerned people and others who are quick to attack you. You’re not only dealing with a crisis situation, but now you have to figure out how to handle your farm or company’s online presence. But wait. How do we even know it’s a crisis? You could argue that when you’re in a crisis, you’ll definitely know. But, there’s a big difference between a crisis and an issue. You need to first determine the severity of the situation before progressing because while we often refer to crisis and issues as the same thing, they have different execution plans. Ask yourself these four questions to determine if you have a crisis on your hands. Does the situation negatively impact the reputation of my farm or company? Does the situation effect your bottom line? Does the situation have a high-risk of going viral? Does the situation negatively impact consumer trust in the industry? If you’re nodding your head to more than a couple of these questions, it would be time to activate your online crisis management plan. Let’s talk about what you can be doing now to make sure your plan is ready to go. 1. Identify all potential crisis situations. Have you thought about all the potential crisis situations that could happen on your farm or at your company? Food safety recalls, an accident on your farm, or maybe a sudden halt in operations because of a natural disaster. The first step is to identify the crisis situation and potential responses for each. How will your farm respond to an accident on the farm? Do you know what you would say? Write that message down because having this drafted message will save you a lot of time during the crisis. Now where are you going to keep all those messages? A binder or a bunch of sticky notes is NOT your best option. Remember a crisis doesn’t hit when you’re at your desk. You need to be able to quickly access the messaging on multiple devices, and share with your team. 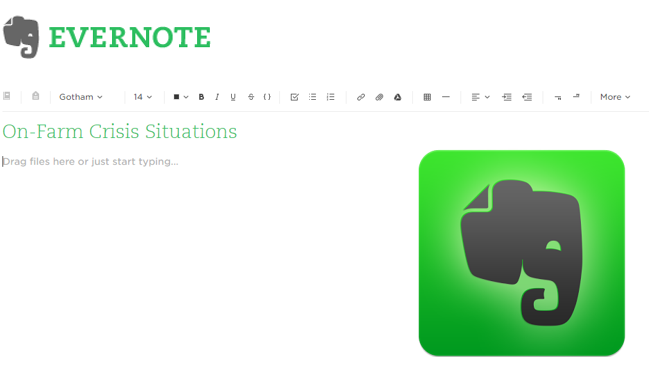 Try Evernote – it’s a free note taking mobile and web application that will help you keep everything organized and easy to find. 2.Create a list of supporters. During a crisis, you can’t stand alone. Think of this as the emergency list you leave on the fridge for your babysitter. Here are some considerations for people to add to your crisis-call list. Online Advocates: Who are your people online? Your online community can be your biggest support during a crisis situation. It might be your farm or company page followers or members of your online groups. Consumers: Your online fans. If you have a strong online community of friends and followers, they’ll step up and defend you during a crisis situation. Where are we going to keep all this information? Again, Evernote is a great place to keep all this information. Write down names and not organizations. You should have a specific contact person within the organization and it’s good to revisit the lists annually since roles change often. Your online community is waiting for a response. Now it’s time to determine when and how to respond. It’s a sensitive time for everyone so make sure you take proper steps when responding. Investigate: Do not respond to anyone without first seeing who they are. While you can’t see the person screen to screen, you can easily investigate who they are by clicking on their profile or doing a quick google search. Why is this important? During a crisis your time is valuable and you should spend thoughtful time responding to people who are willing to engage and listen. Don’t waste your time responding to hateful and vulgar comments. Our advice is that you should block and delete. Take it offline. In a crisis situation, like a food recall or people getting sick, try and take the person offline. Get them to a hotline. Make sure you’re getting people to the right information, and fast. 4.Practice. Practice helps you identify gaps and then adjust. Spend time with your team reviewing the messaging, updating your crisis-contact list and practicing for each potential crisis situation. It’s not a one-time deal and you can check the crisis-preparedness box. It’s ongoing. As a team, commit to practice annually (or more) and set dates to follow through. Now is the best time to get ready for a potential crisis. Want more practice? Or do you need help developing crisis resources? The best place to start is your local checkoff programs as most have crisis materials for your farm or you can always reach out to me at don.schindler@dairy.org and we’ll figure out a way to get you what you need. PS. Since 2001, Dairy Management Inc along with local dairy checkoff programs have developed and executed industry wide crisis drills. These drills bring together the entire value chain (farmers, co-ops, promotions, processors and retailers) and test our crisis preparedness as an industry. If you are interested in learning more about our industry crisis drills, please contact me and we can tell you more about it. Original article published on AgChat.